At ProWash we are the authorized dealers of hood fans, filters and supplies. Call us today Hood filters and Roof grease containment products. 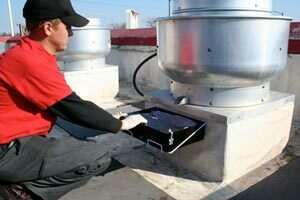 Roof hood filters when properly maintained will help to keep your restaurant safe from grease buildup and fires. Simple regular maintenance could have avoided this situation. The Smith FIRE PATROL is made from a unique roll formed baffle, designed to prevent flame from penetrating through the filter into the duct work. Two layers of equally spaced baffles create an air flow which gives unsurpassed performance in efficient grease removal. Smooth baffle surfaces cause a continuous run-off, allowing grease to be safely deposited in collection troughs. Classified by Underwriters Laboratory Inc. as to flammability only after exposed to grease-laden air. Designed to be used in grease hoods and fryers. The FIRE PATROL was created to replace the mesh style filters, without concern for costly hood modification. The FIRE PATROL is available in Heavy Commercial Aluminum “A“, Hot Dip Galvanized “G“, OR Stainless “S“. Handles are not included. This Galvanized Steel baffle filter is designed to hold up through the toughest conditions. The Smith FIRE GUARD “G” is made with heavy 24 gauge Galvanized Steel throughout the filter, including the baffles. Two layers of baffles are carefully aligned to eliminate the direct passage of flame and grease through the filter. The heavy guage gives it the strength needed to withstand numerous cleanings. Secured in place, the baffle pad will not shift or bend being handled. Because of the extra weight, the filter won’t vibrate when installed. Grease-laden air is forced to swirl, preventing accumulation of grease on the baffles. Drain holes along the bottom of the filter allow rapid runoff into the drain trough. This filter was designed for the Hood Service Companies, which require numerous cleanings of their filters. That’s why it’s known as “THE RUGGED” Grease Filter. UL approved for grease. The Smith THRIFTY FLAME STOP is a 1″ grease filter, made from sturdy Galvanized steel. Two layers of baffles are uniformly placed to prevent laden grease from collecting in the duct work plus preventing flames from penetrating through the filter. This filter can be cleaned repeatedly without losing shape or effectiveness. Designed to replace the 1″ mesh filter without having to reconstruct the hood or fan system. As with all Smith Grease filters, the THRIFTY FLAME STOP is UL Approved for Grease. Handles are not included but are available upon request.